You may have seen recently the exploits of one Ed Whitlock, a Canadian runner, aged 82 who recently ran a marathon in 3hrs 41mins. But that’s not all, Ed is and still remains the only person ever to have run a sub 3 hour marathon over the age of 70, to which he’s done it three times. 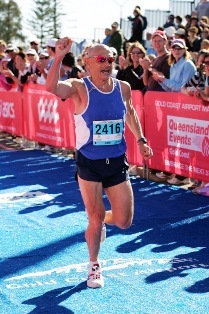 My mind also turns to one of the legends of Australian marathon running, Ray James who was one of my early inspirations for running here in Australia, when I moved here from the UK in 2007. And who can forget 101 year old marathon runner Harmandar Singh!?! Ray has some phenomenal achievements of his own, on top of running 19 marathons this year alone and over 170 in total, he also ran a 2:58 marathon at the age of 58. At 64 (I think! ), he’s still regularly running 3:30 marathons. It just goes to show that despite being in the twilight of their careers, older runners can achieve some pretty amazing things. It was to this end that my mind turned to older runners and the effect of age on our running ability and also recovery. Do we really slow down with age and how can we help the process of recovery to get the best out of our bodies as we age? Recently, I was asked, to what extent does the recovery process and necessity of rest change in an older runner? The question came from a remarkable 65-year-old athlete who recently ran the Boston marathon. Following the event, he pulled up stiff and sore, especially in his hamstring muscles. He explained that even with plenty of therapeutic treatment and stretching, it had still taken him ten weeks to recover. For me, his story raises two questions, does age alter the degree of damage that occurs to the body during intensive exercise and is the recovery rate significantly delayed? The World Masters Games attracts over 20,000 competitors, highlighting the flourishing interest in maintaining a high level of physical performance throughout the lifespan. Bringing this closer to home, you only have to look around at local fun runs and indeed the ultra-world to realise that quite a few of the athletes participating are ‘older’. For the purposes of this post, ‘older’ refers to greater than 50-years-old, an age at which commentators in our sport have noted rapid decline in physical athletic capacities. Ageing is accompanied by significant declines in physical functioning capacity. Although regular exercise helps to protect against age-related illnesses, older runners will notice a decrease in performance and, like my correspondent, often a delay in their recovery following higher intensity efforts. So, why does performance decrease with age and what causes the delay in recovery in older athletes? Unfortunately a number of physical changes occur as we age that will affect our performance. These include (but are not limited to) changes to skeletal and heart muscle, and glycogen uptake and re-synthesis. Skeletal muscle is the muscle that generates movement and power as we run, and an older runner will undergo greater exercise induced skeletal muscle damage. With advancing age, the muscle’s ability to repair and adapt is diminished. This could be caused by a decrease in muscle capillarisation and mitochondrial activity (the power generators in the muscle). However, the good news is that training in older age can impart a protective effect on skeletal muscle, thus delaying these effects. This leads us to a discussion about running training in older athletes. The main purpose of training is to unbalance the homeostasis of an individual’s functional systems, and the natural consequence of this is some degree of fatigue. If the body is allowed to recover with effective rest and nutrition, this should lead to adaptations that will prepare the individual for future physical demands and preferably, increased performance. However, does this process of insult and enhancement differ with age? A discussion paper by Fell & Williams, proposes that following an equal training stimulus, older athletes will experience greater damage and fatigue which delays the recovery response. That is, an older runner is likely to feel sorer, more tired and take longer to recover. Fell & Williams propose that if a younger athlete and a veteran athlete move through the exact same training cycle involving regular training stimulus’ followed by a period of recovery, the younger athlete will enhance their performance whilst the older athlete will begin to show a decrease in performance. As noted earlier, the veteran athlete requires a longer recovery period than the younger athlete, and this should be accounted for in the training program. Of concern is that continued training without adequate rest actually results in progressive overreaching. Here I will refer to my dear old coach Max Cherry. Max always used to say that for every 10km we race, we must allow one week to recover. This meant that following a marathon, I would allow myself four weeks to return to full strength before I began hard training again. I was just 20-years-old at the time. This theory has never failed me and is thoroughly supported in the scientific literature (Smith & Norris 2002). If we take into account the notions put forward above, an older runner might be looking for at least five to six weeks gentle recovery before jumping back into a higher intensity program. A discussion on recovery would not be complete without mentioning nutrition. It is generally regarded that older adults should consume adequate carbohydrates during endurance training (6-8g/kg/day) and may benefit from the provision of carbohydrate and protein in the early recovery phase following endurance exercise to maximize glycogen re-synthesis in the muscles. The most important concept that I have ascertained from my research is that runners greater than 50-years should allow for an increased quantity of recovery following high-intensity efforts due to the increased muscle damage. Nutrition should focus on protein to assist in the muscle repair process and carbohydrates to increase glycogen re-synthesis. Finally, if in doubt, err on the side of safety and have an extra rest or recovery day – any training that you are doing is imparting a protective effect on your muscle and heart, and warding off age-related problems. I am 51 and I’ve realised it’s very important, at least for me, to listen to my body with training rather than blindly follow a training plan. I train on a fairly ad hoc basis, adjusting each run or gym session to suite how I feel. It helps prevent small niggles during a training session from developing into something bigger. I agree that nutrition is very important in the recovery. After a 15 hour Sydney Oxfam this year, I was back to full strength and training within 5 weeks and I put that down to being strict with my training/nutrition plan. I turned 60 years old recently & know the benefit of easy days, rest days & cold water to help with recovery. A little back to back long runs also help maintain muscle memory. Otherwise, the old adage of hard day, easy day & some cross training apply. Listening to how you feel & not sticking too strongly to a training plan are the way to go. Bogong to Hotham in Jan next planned adventure, should be fine.